In the past year, the U.S. was faced with a rising issue — race relations. With the travel ban, the white supremacist rally in Charlottesville, the police shootings against black males and the unknown future of DACA, conversations about the treatment of ethnic, racial and minority groups began. 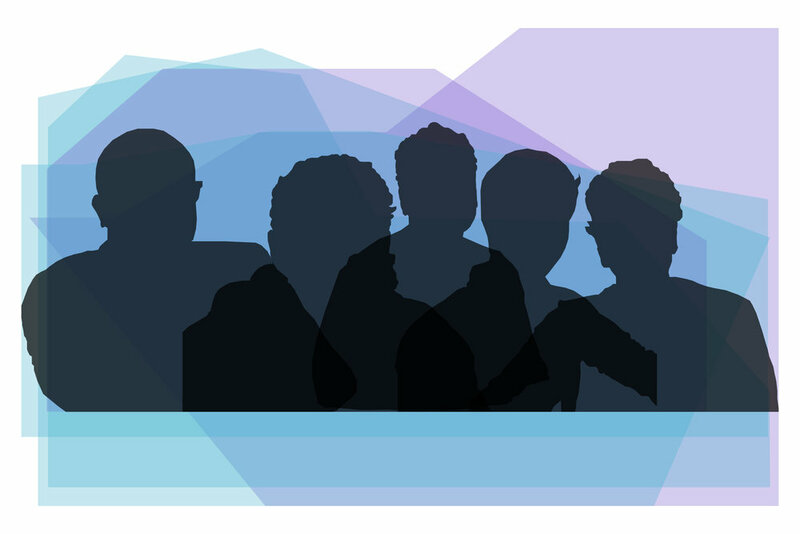 We surveyed 42 North Carolinians and spoke to eight respondents about their thoughts and experiences with race relations in our state and the country as a whole. 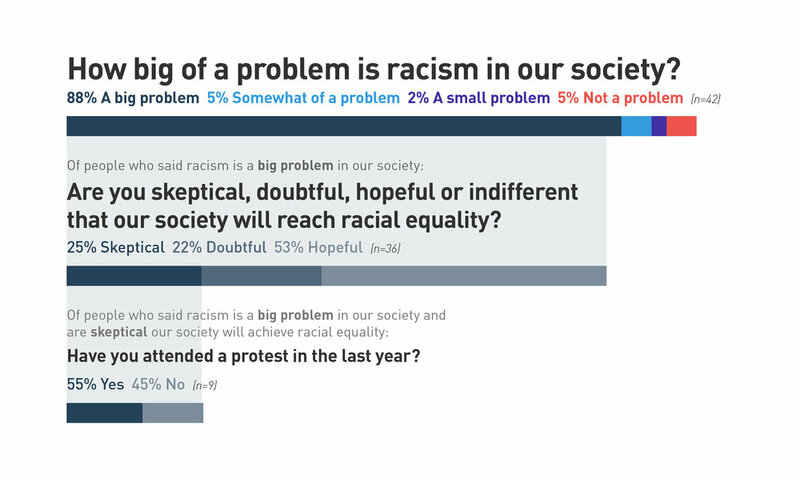 Although 25 percent of respondents who said racism is a big problem in our society are skeptical we will reach racial equality, 55 percent have attended a protest in the last year. 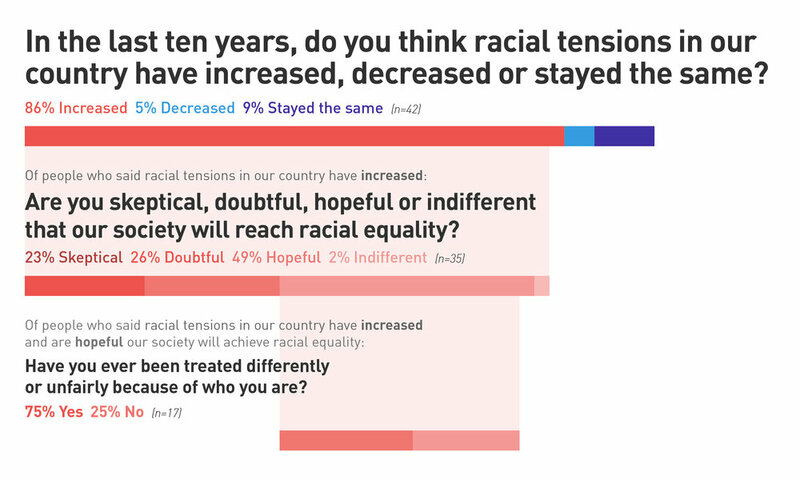 Although a majority of respondents think racial tensions have increased in the last 10 years, they are hopeful our society will reach racial equality. Megan said she has experienced discrimination based on her appearance. This survey respondent says racial tensions have stayed the same in North Carolina and the United States. A third of respondents who are doubtful our society will reach racial equality have been treated differently or unfairly because of who they are. As a white male, Ryan feels he shouldn’t be treated any better than other people. 50 percent of respondents who said racial tensions have stayed the same in North Carolina also said they have increased in the country overall. 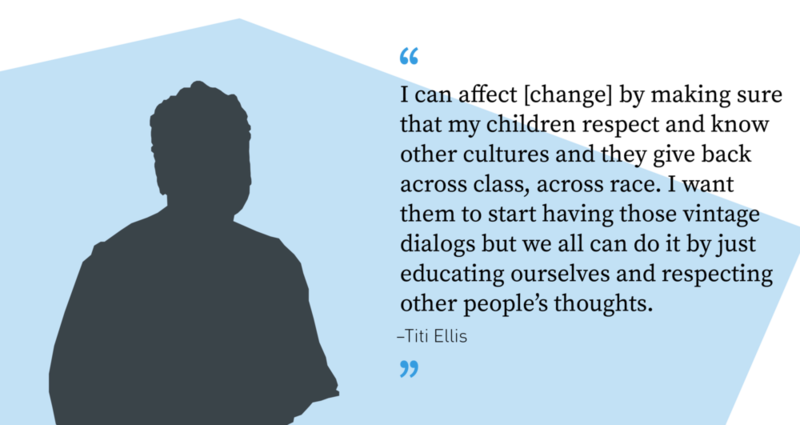 Titi Ellis said having difficult conversations with family and friends needs one component: being fearless. She said she has instilled the value of hard discussions into her kids, specifically “vintage conversations”: her term for face-to-face conversations. Ellis said she is trying to understand why people think the way they do through these conversations. She does get frustrated, however, hearing stories from non-minority groups about how hard it is to succeed. “As a person who grew up in southeast D.C. in a poor neighborhood with middle class parents — my parents were better off than some — it was tough and I knew education was the way that I was going to get everything,” Ellis said. One of the barriers that gets under Ellis’ skin is the mad black woman stereotype: if a black woman is firm, she is seen as crazy. Throughout her life, Ellis has been conscious of how she is seen as a black woman but, when she moved to North Carolina from D.C., she became more aware of the racial divide. A mural outside of a Raleigh Harris Teeter made Ellis think about how our society undervalues diversity. She does think younger generations care more about shared interests than the color of one’s skin. Educating the next generation about accepting different races is one of Annette Freeman’s missions as a mom. Freeman said her first conversation about racism with her kid came when her son in the third grade was threatened for being Jewish. She went back to her faith to teach him that differences are OK.
She said educating her kids to about inclusion was especially important because her parents taught her to fear people who were seen as other. “The biggest thing any of us can do, especially women who become moms, is raise our kids to see that [diversity] is a good thing,” Freeman said. Freeman said she sees racism as a problem in our society, especially after the last several years in the U.S. and in North Carolina. She considers those who stay silent are also a part of the problem. She added children make her hopeful that we can eventually achieve racial equality. Brian Nguyen is first-generation Vietnamese American. 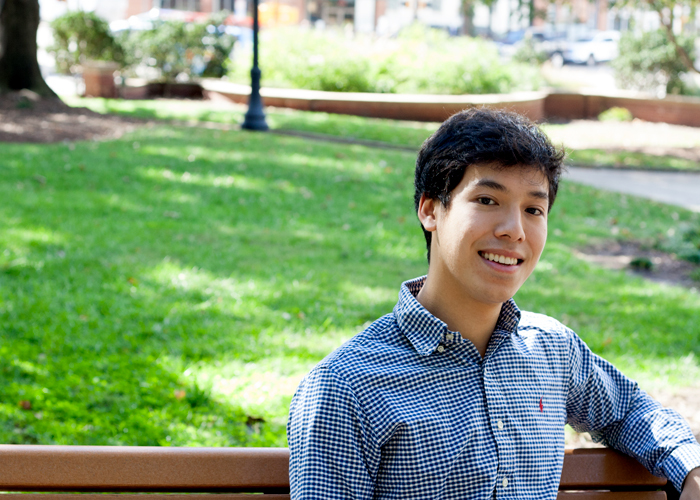 He’s the vice president of the Asian Student Association at N.C. State, an organization that aims to bridge together cultures from Asian countries. The organization also helps promote Asian culture in the N.C. State community. He said he better understands not judging someone based on the way they look after joining and participating in a black church. He said attending the church has helped him learn more about race and relations. Nguyen said learning about different people and not only hanging around people who are similar to him is important and combats ongoing racism. Nguyen explained Asians aren’t as impacted by hatred as other races but are often ignored. As a kid, Nguyen said he struggled with fitting in to American culture. He felt he couldn’t explain this isolation to his parents or older brother, who has Aspergers. Nguyen explained Asian languages don’t give an outlet to this isolation and loneliness. Growing up in the the Pacific Northwest, Lynn Sullivan had no exposure to people of color until she went to graduate school in Georgia. She added even then she didn’t quite understand her privilege until she was driving in rural Georgia. She said after this event she has become more aware of race relations in the U.S. but more recently has begun to understand the issues within, like police brutality against black men. Sullivan has worked as a planner for public parks in Raleigh, and she knows the value of including a diverse group of populations to have a successful park. “You need to have multiple populations, you can’t have one population overtaking it, running it completely,” she said. Sullivan has taken on the role of educating others about challenges that minority groups face. Not being inclusive to different cultures and populations is a norm in the U.S., according to Sullivan. She added the U.S. needs to ensure that hate groups, like white supremacists, aren’t given a voice. When Donald Trump was running for president, Action NC, a nonprofit that helps low-income communities mobilize and take action, saw the need to facilitate a conversation about race relations. According to Gloria De Los Santos, the Durham director of Action NC, the organization wanted to dive deeper than the history of racism to understand how racism came to be. “If you’re going to talk about race, let’s bring it all the way back to the history of where it started,” De Los Santos said. She said since Donald Trump became president, she is not alarmed by his controversial comments. De Los Santos added people have racist tendencies and addressing how to deal with that as an individual is a challenge for Action NC. De Los Santos said having conversations with community members by going door-to-door and conducting meetings is the best way to get public involvement. She explained at these meetings they decide the best tactic for action, whether it’s talking out an issue, speaking to a community leader, conducting a march or going to the press, which is the last resort. With victorities, Action NC takes time to reflect and figure out their next move to keep the community active in change. 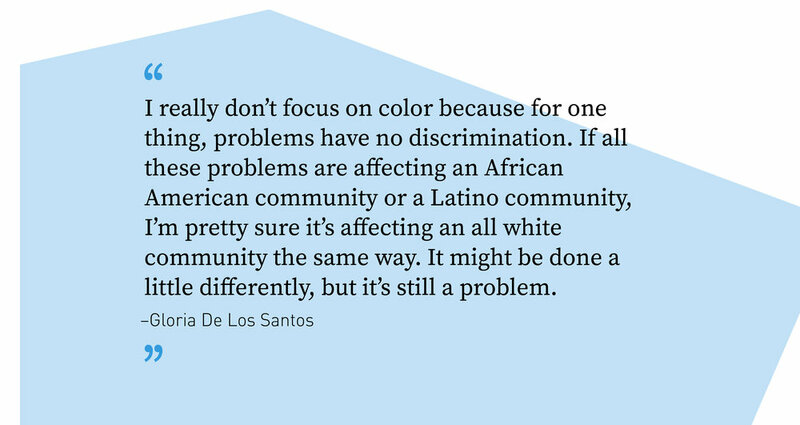 With her involvement, De Los Santos said she has realized problems don’t only impact one minority — it may just impact them differently. 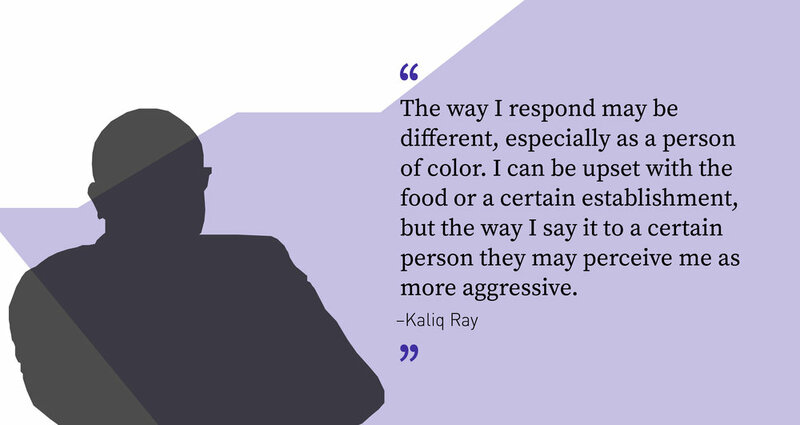 Kaliq Ray is aware of the stereotypes that come with being a black male. He said he goes into situations thinking of how to mitigate those stereotypes. While visiting New York, Ray did just that — he greeted the security guard at the place he was staying and dressed well. He soon learned that he still would be judged because of the color of his skin. Ray realized he made one mistake — he did not remember the floor of his friend’s apartment. While his girlfriend and friend were getting ready, Ray went down to use the lobby bathroom to give them privacy. He greeted the security guard, went to the bathroom and came out to see a different security guard. “I tried my best, from a visual standpoint, to bridge that buffer between what we know about someone who is homeless or crazy or on drugs — I try not to meet those stereotypes visually,” Ray said. Ray said he ignored these looks and returned to apartment, not paying attention to the floor he was on. Not trying to wander throughout the building, Ray went to the lobby to ask the security guard for help. According to Ray, the security guard met him with accusation: why don’t you call your friends; are you a crazy ex-boyfriend? After unanswered calls and a visit to the apartment, Ray was reunited with his friends. He knew he did his best to minimize the conflict, even though he was in the right. “In that situation, I could always lose,” Ray said. Throughout this experience, Ray was conscious of the stereotype he brings — black men are aggressive. He said he thinks about how the color of his skin will factor into any situation, like attending a protest. 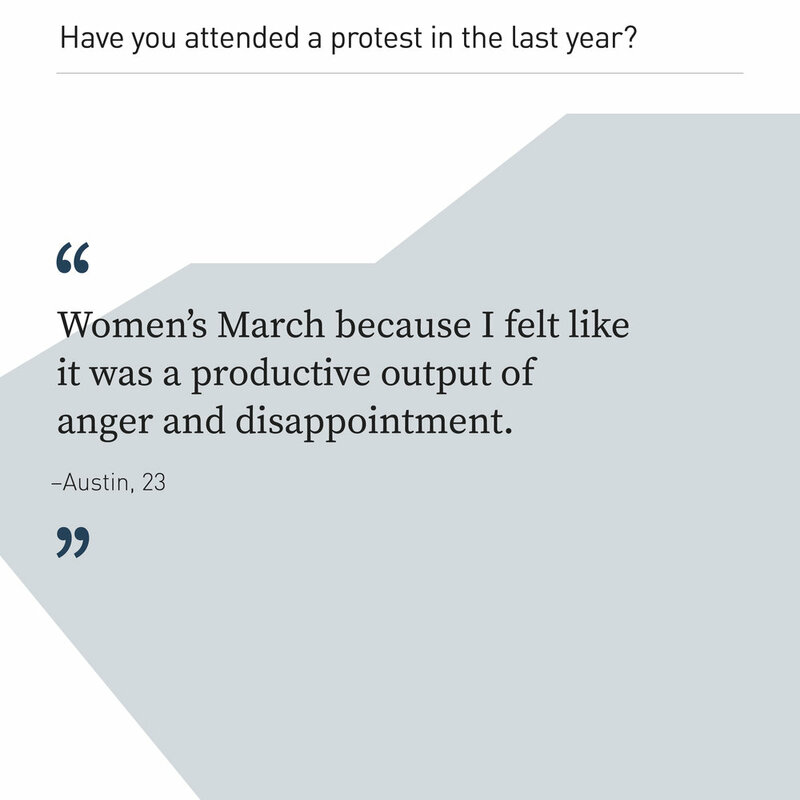 “I want to protest, but sometimes it’s like, you’re going to be the one that gets killed,” he said. He added he wants people to be mindful that racism may be more institutionalized than it seems. With his younger cousin, he has begun to question if his behavioral problems are actually caused by mistreatment. 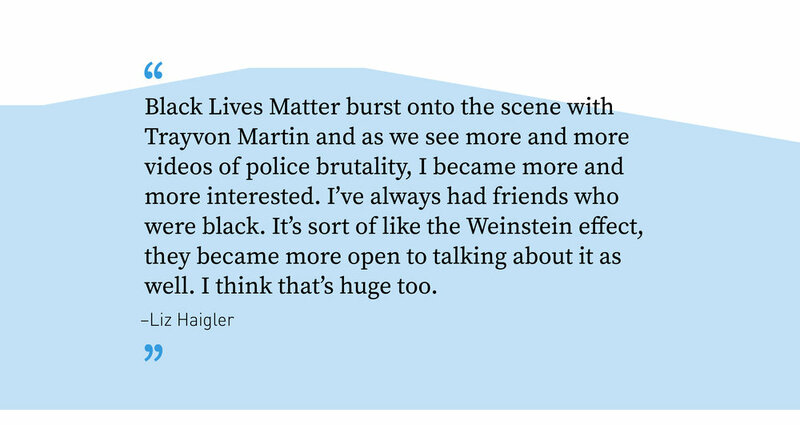 Liz Haigler considers herself an ally for the Black Lives Matter movement. She grew up in an integrated school and became aware of the issues that challenge black people at an early age. Looking back to her childhood, she wonders if her friendships with black classmates caused her to be bullied as a child. Haigler said with these friendships, she wanted to be an ally for the black community. Before the officer-involved shooting of Keith Lamont Scott, Haigler joined a Black Lives Matter ally group for white people. “Black Lives Matter burst onto the scene with Trayvon Martin and as we see more and more videos of police brutality, I became more and more interested,” Haigler said. After the shooting, she became more involved in the movement by lobbying to change legislation in Charlotte with New South Progressives and educating the community about the New Jim Crow. Haigler said she began to get some push back for her involvement in event planning for race discussions. Haigler said after Scott was killed and the protest of his death, she wasn’t the only person to be more involved in the community. She said although she thinks racial tensions have increased, she knows it’s because people are more aware of the issue. Facilitating hard conversations about race is important to Taylor Cashdan. He was exposed to multiple cultures from a young age. Living in New York, his family interacted with people of “all shapes and sizes” traveling through the boroughs, and they didn’t speak about other races with hatred. Cashdan explained it was easy to be around people who looked different than him because, as a kid, you just want someone to play with. When he left the melting pot and moved to North Carolina in fifth grade, he recalls being made fun of for being Jewish and learned that he didn’t want to rule out groups of people because they are different than him. He did find a community similar to the one in New York in his new neighborhood and at school. Cashdan added making friends was easy for him because he didn’t look like one specific race and was extroverted. “I was always a hybrid person anyway if you want to categorize it,” he said. Cashdan still hangs out with a diverse group of friends but now that they’re more mature, he can have conversations about race and is also more aware of how the Raleigh community judges them. He added he ensures that he and his friends aren’t using race as an excuse and are willing to talk about the causes of mistreatment.